These events could not happen without the selfless efforts of the volunteer force. If you would like to volunteer please email the race director (briang@cliffsandmeadows.com). Volunteering could include course marking/ sweeping. Aid station help, highway crossing marshals, shuttling supplies etc. Check-in will be from 5:30 a.m.- 6:20 a.m.
A mandatory pre-race briefing will held race day morning at 6:20 a.m. The race will begin at 6:30AM sharp. There is a 9:30:59 race time limit with intermittent cutoff times (see the maps page). Cutoff Times: For your safety and for consideration of the volunteers there are various cutoff times throughout the race. Runners must LEAVE the aid station before the cutoff time. Also note that there is a strict 9:30 hour finishing cutoff. No Early Start Option: There is no early start option. The Noble Canyon 50k will have an official start and an official end. Pacers: No pacers are allowed on the course. CREW & spectators, Change: Spectators are allowed at the Start/Finish area only. No crew is allowed at any of the aid station in 2019. No Pets: We love our pets as much as you do; but please leave them at home. Absolutely no dogs allowed at any aid station or at the start/finish area. Drop Bags: Drop bags will NOT be collected or distributed. Course markings: The course will be marked with orange surveyor’s ribbon, gypsum (chalk), and possibly signs. A ribbon will be placed every 2-3 minutes running time. Keep your head up and look for junctions. Junctions will have multiple ribbons. IMPORTANT: If you go more than 5-7 minutes (running time) without seeing a ribbon TURN AROUND you missed a junction. Entering an aid station: Make sure you check-in at every aid station with the volunteer that is holding the clip board. Properly Dropping (DNF or Did Not Finish): If you decide not to continue the race or miss a cutoff or get pulled for any reason you must personally tell an aid station captain and give them your BIB. Retrieving your bib is our accountability that you are officially off the course. If you do not properly drop and a search and rescue effort is launched on your behalf you will be responsible for the cost of the rescue effort. Littering: Our ability to secure permits for each of our local mountain events is dependent on all of us being good stewards of the trails. Anyone caught littering will be disqualified from the race. If you see trash out on the trail please try to pick it up and carry it to the next aid station. #2 out on the trail: There will be restrooms or outhouses at the Start-Finish / Noble Canyon Trail Head / and at the highway crossing at Penny Pine. If nature calls while on the trail, get off the trail and bury your business. Highway crossing: There are two highway crossings. It is YOUR responsibility to safely cross the highway. We will have crossing marshals at both highway crossings throughout the duration of the race. The marshals will not stop traffic, you can think of the marshals as an extra set of eyes and ears for you. Running along the road. The first and the last mile of the race is on a road with blind turns. Use extreme caution especially if you hear a car approaching. All participants must be at least 18 years of age and older. 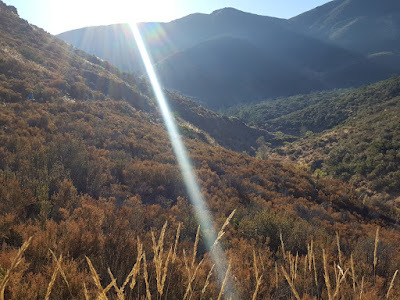 Water: The Noble Canyon 50k has traditionally been a “hot” race. Some of the sections between aid can be quite long. Carry adequate water in water-bottles or a camel-pack.